Brighten up your night with the vibrant paprika marinade on this tasty and tender Portuguese chicken. 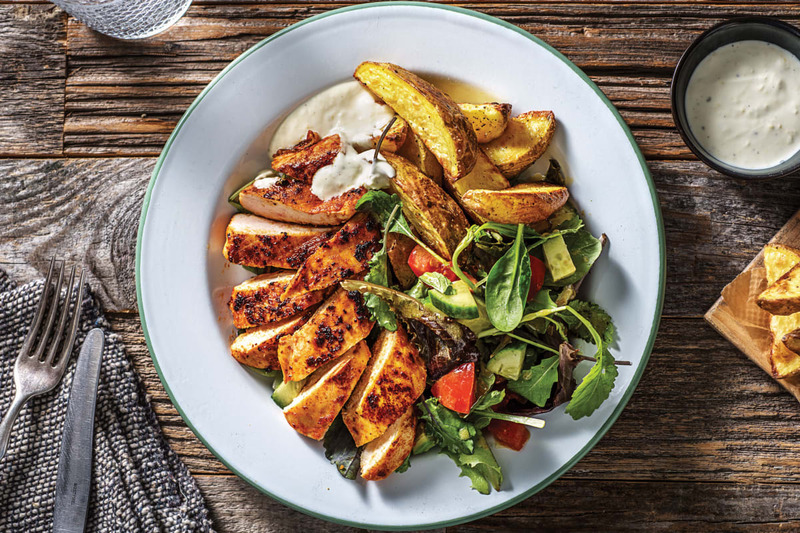 Infused with smokey flavours, plus sides of hearty potato wedges and a refreshing salad, this colourful plate adds a little international flair to the old meat-and-three! Preheat the oven to 240°C/220°C fan-forced. Cut the potato (unpeeled) into 1cm wedges. 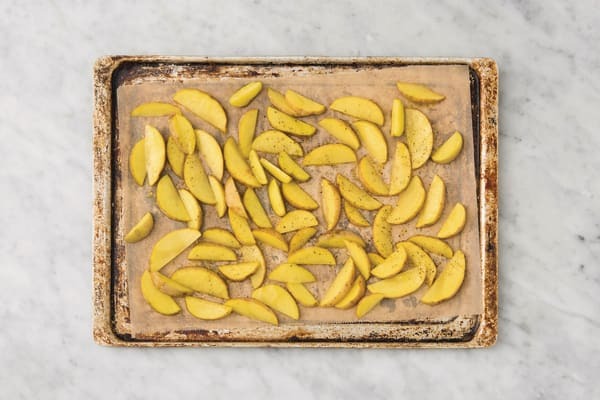 Spread the potatoes over two oven trays lined with baking paper. Drizzle with olive oil, season with a pinch of salt and pepper and toss to coat. Roast until tender, 25-30 minutes. TIP: Cut the potatoes to the correct size so they cook in the allocated time. While the potatoes are roasting, finely chop the garlic (or use a garlic press). In a medium bowl, combine the garlic, salt, smoked paprika, brown sugar, a small squeeze of lemon juice, a drizzle of olive oil and a pinch of chilli flakes (if using). 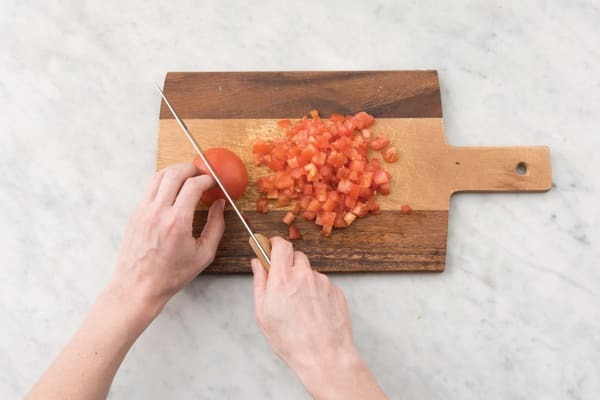 Place your hand flat on top of a chicken breast and use a sharp knife to slice through horizontally to make two thin steaks. Repeat with the remaining chicken, then add to the marinade and toss to coat. Set aside. When the wedges have 10 minutes cook time remaining, heat a drizzle of olive oil over a medium-high heat in a large frying pan. 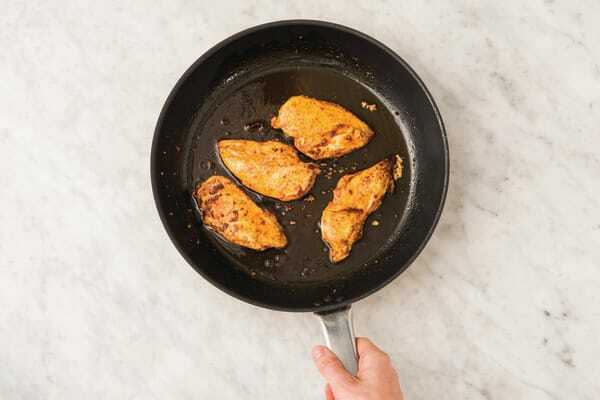 When the oil is hot, add the chicken breast and cook until lightly browned and cooked through, 2-4 minutes each side (depending on thickness). Transfer to a plate to rest. TIP: The sugar in the marinade may caramelise slightly in the pan. This makes the chicken even more delicious! TIP: The chicken is cooked when it is no longer pink inside. While the chicken is resting, finely chop the cucumber and tomato. In a large bowl, combine the Dijon mustard (see ingredients list), honey, a small squeeze of lemon juice and olive oil (2 tsp for 2 people / 4 tsp for 4 people). Season with a pinch of salt and pepper. Add the cucumber, tomato and mixed salad leaves to the bowl with the dressing. Toss to coat. 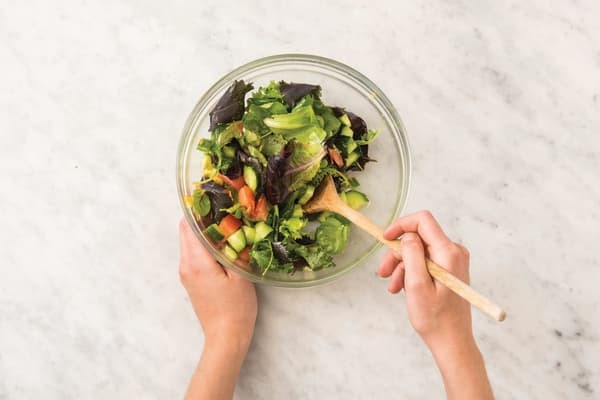 TIP: Toss the salad just before serving to keep the leaves crisp. 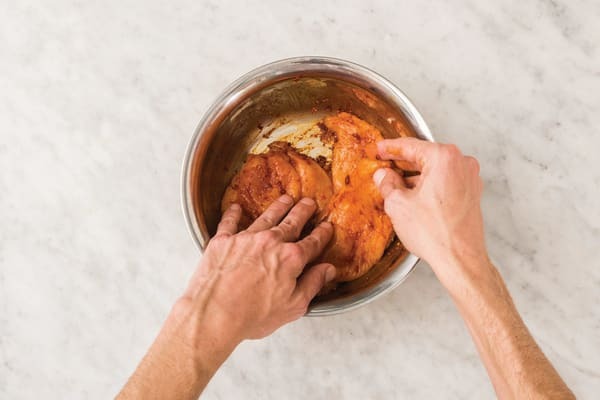 Thinly slice the Portuguese-style chicken. 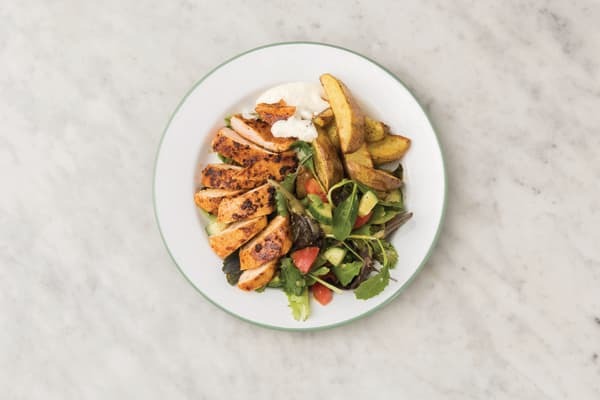 Divide the chicken, potato wedges and garden salad between plates. Serve with the garlic aioli.